Fraudulent organic imports and the industrial model of production under the organic seal is hurting the profitability of organic family farmers. Two panels focused on options for better oversight. Despite increased documentation of fraud, the National Organic Program is still lacking systems to monitor imports. The National Organic Standards Board made a formal recommendation to protect native ecosystems from conversion into organic production, a project Cornucopia has been supporting for years. Like Cornucopia’s mobile-friendly, organic brand scorecards, the need for add-on labels illustrates the failure of the NOP to assure compliance with the spirit and letter of the law as written in the Organic Foods Production Act. 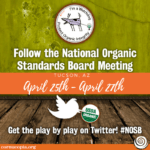 The spring 2018 National Organic Standards Board (NOSB) meeting was held the last week of April in Tucson, Arizona. Cornucopia’s policy experts spoke to the organic community about the struggles facing organic family farmers due to fraudulent imports and the increasing representation of the industrial model of production under the organic seal. In many cases, farm prices for organic milk, eggs, meat, and produce are below the cost of production for family farmers, and contracts with wholesale buyers are not being renewed. Organic family farmers are forced to switch to direct marketing, revert back to conventional production, or, in some cases, close their operations. Amid this crisis, Cornucopia has recently broken news about a questionable shipment of organic corn apparently originating in Russia. U.S. Customs denied entry on the basis that importing whole corn from Russia is illegal. Had organic tracking systems worked effectively, the shipment would have been flagged at the outset by the National Organic Program (NOP), as originating from a suspect region. Instead, the NOP only heard of the shipment because U.S. Customs and the USDA Animal Plant and Health Inspection Service (APHIS) contacted the NOP due to potential pest and pathogen concerns. In her testimony to the NOSB, Anne Ross, a farm policy analyst for Cornucopia, stated that the vessel carrying the rejected shipment of Russian corn was at that moment moving off the coast of California. Concerned that the crew might find an alternate way to illegally unload the corn in the U.S., she stated that she is tracking the shipment and asked, “Is the USDA tracking the shipment as well?” Cornucopia and other organic advocates have pressed the USDA for strict oversight of all imports coming into this country. The question is apt, given that the NOP previously informed John Bobbe, Executive Director of OFARM, that organic regulators do not track vessels, despite the availability of publicly accessible databases that provide this information. Bobbe, a panelist invited to present testimony to the NOSB, chronicled the history of massive shipments of purportedly organic grain that have arrived at U.S. ports in recent years. Whether the USDA is beginning to track these vessels originating from high-risk regions remains unknown, and Cornucopia will continue to report on imports and the status of regulatory reform. Cornucopia provided detailed written comments to the NOSB articulating ways that the NOP could crack down on import fraud. To start, Cornucopia recommended that an organic certifier’s role in data collection should increase, particularly related to organic acreage and yield data. Fraudulently labeled organic grain has originated in regions with a high prevalence of commercial fraud, such as Turkey and former Soviet Bloc countries, where inconsistencies in organic acreage and realistic yield data are valuable tools in identifying fraud. Some skeptical certifiers at the meeting raised concerns about confidentiality protections of farm yield data and difficulties in ensuring accurate reporting of yields. Cornucopia contends that organic production yields from high-risk regions could show whether a country is even capable of producing the volume it exports. Cornucopia also questioned the NOP’s reliance on certifiers for regulatory enforcement, which raises significant concerns given the lax oversight by some certifiers located overseas. Lax oversight by certifiers of questionable competence encourages “certifier shopping,” where an operation seeks out a certifier known to overlook non-compliances. At the meeting, a representative of a European certifier testified that the NOP must engage in more effective supervision of certifiers. NOP audits are often ineffective because they are usually announced ahead of time and are therefore predictable. This problem is compounded by the fact that certifiers in the U.S. are businesses paid by the operations they certify. The conflict of interest inherent in the system can elevate profit motive over integrity if the NOP does not vigorously audit certifiers. The USDA’s Office of the Inspector General has criticized the NOP for lack of oversight of the certification process in the past. Another point of controversy at the spring NOSB meeting was whether GMO and pesticide testing of imported products should be required at ports and U.S. borders. Some industry representatives questioned the utility and the expense of the testing. Sam Welsch, founder of OneCert and president of the Accredited Certifiers Association, pointed out practical realities that warrant independent testing. A single transaction, such as in the case of bulk shipment of grain, could affect the price of the organic product in the U.S. The percentage of the occurrence of fraud should not be the sole focus when considering the utility of mandatory testing. The volume of shipments must also be considered. Welsh elaborated, “Some people have excellent records, so excellent that they have records for things they didn’t do.” In 2017 The Cornucopia Institute submitted a formal citizen petition to the USDA requesting mandatory testing of all bulk shipments of organic commodities. The discussion also highlighted numerous contrasts between the more stringent oversight in the European Union and the weaker enforcement mechanisms in the U.S. In the European Union, a control body has the authority to stop an operator from marketing a product that is not in compliance with the organic production rules. In the United States, neither certifiers nor the NOP have “stop-sale” authority. Congress would have to empower the USDA, through legislation, with the authority to stop the sale of products that are suspected of failing to comply with organic regulations. The European Union was also lauded for its electronic system, which traces organic certificates throughout the supply chain. Bi-partisan legislation has been introduced to allocate $5 million in mandatory funding for improving import data tracking systems. It’s clear that electronic data tracking will fail to effectively detect fraud unless information collected by U.S. Customs and other USDA departments is consolidated or assembled through coordinated efforts among agencies. In the meantime, the NOSB referred the fraudulent imports issue back to its Certification, Accreditation, and Compliance Subcommittee (CACS) for further discussion to identify mitigation steps and focus on areas of greatest impact. Given what is already known, that there is an enormous impact on the farm prices that our domestic producers are receiving, the need for expediency cannot be overstated. Also of significance at the Tucson meeting was the passage of an NOSB recommendation for rulemaking to protect native ecosystems. Cornucopia has worked for many years on eliminating an incentive in the current regulations to convert native lands into organic production, in collaboration with the Wild Farm Alliance (WFA). The Organic Foods Production Act currently requires conventionally farmed land to be managed organically, without the use of prohibited agrichemicals, for a minimum of three years before qualifying for organic certification. Without a regulatory change, the organic standards actually incentivize farmers to convert wild lands into organic production because they are not required to go through the three-year transition period. While the organic standards speak to supporting biodiversity, the unintentional incentive to convert native and high-value ecosystems is a serious problem that needs to be addressed. These lands provide valuable ecosystem services to human populations and habitat for native plant and animal species, along with a myriad of other benefits. 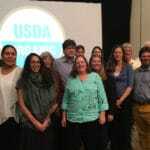 At the Tucson meeting, the NOSB recommended adding a definition for “native ecosystems” to the regulations, including language provided by Cornucopia and the Wild Farm Alliance. It was recommended that land that fell under that definition would not be allowed to be considered for organic certification for a minimum of 10 years, thus reducing the incentive to convert it into production. The Cornucopia Institute thanks and recognizes the Wild Farm Alliance for their long-term leadership in pushing for this important rule change. In addition to former NOSB Chairman Dr. Flamm, Marie Burcham, a food and farm policy analyst at Cornucopia, spearheaded our involvement. The recommendation will now be forwarded to the USDA Secretary. Already, during the short Trump administration tenure, the USDA’s track record of respecting guidance from the NOSB has been spotty at best. The passage of the native ecosystems proposal is an example of the process of continuous improvement under the organic seal that the NOSB was designed to shepherd. However, Cornucopia’s chief scientist, Dr. Linley Dixon, testified that grassroots “add-on” label efforts are arising from NOP’s failures to implement several NOSB recommendations and enforce the current standards. These failures include ignoring recommendations to address origin of livestock, animal welfare issues, and ignoring the recommendation of the NOSB to remove materials such as carrageenan, conventional whey protein, and sodium nitrate from the National List. Prior to the meeting, the Real Organic Project released their provisional standards, planned to be implemented on roughly 50 “pilot” farms this summer. Dixon noted that this particular add-on label is farmer-driven and an attempt to guide consumers to organic products that come from farms using soil- and pasture-based production. The label effort came after the USDA ignored the requirement for soil in the organic regulations by allowing hydroponic production to be certified. Like Cornucopia’s mobile-friendly, organic brand scorecards, add-on label efforts are an attempt to provide market pressure to bring production practices back into compliance with The Organic Foods Production Act (OFPA) and fill in gaps and loopholes where the organic standards have failed to protect family farmers and consumers.